Geelong’s Diversity Cup, the local pre-season tournament is in full swing at Hume Reserve, Thompson Road, North Geelong on Friday and Sunday evenings. This weekend North Geelong Youth beat Geelong Rangers by three goals to two in an entertaining and see-sawing match on Friday. There was a huge contrast of styles as the North youngsters played a close-passing build up from the back, while Rangers had a much more direct approach. It was the dark blues who took the lead from a long ball out of defence which cut through the centre of the North backline. Monga Bertin sprinted away reaching the loose ball just before North keeper Hamish Flavell to open the scoring in the 28th minute. Five minutes later Alessandro Stefano equalised with a lob over Rangers’ keeper Lyndon Malesic at the end of a multi-pass movement down the left. Two minutes more and North was ahead after a series of shots were blocked by Rangers defenders and James Hidic pounced on the last of these. Rangers hit back seven minutes after the break Matthew Long crossed from the right and Daniel Siketa finished off from close range. North scored what proved to be the winner on the hour mark. Stefano set up Matt Humphries for a neat finish. It is an excellent move by North Geelong to field its next generation of youth players in the tournament while the seniors are engaged elsewhere. The idea of the Geelong Advertiser Cup when it was started was that it would be a development competition and give coaches a chance to see the emerging talent at the clubs ahead of the league season. In the second game, Corio proved too strong for a plucky Bell Park team winning by three goals to one. 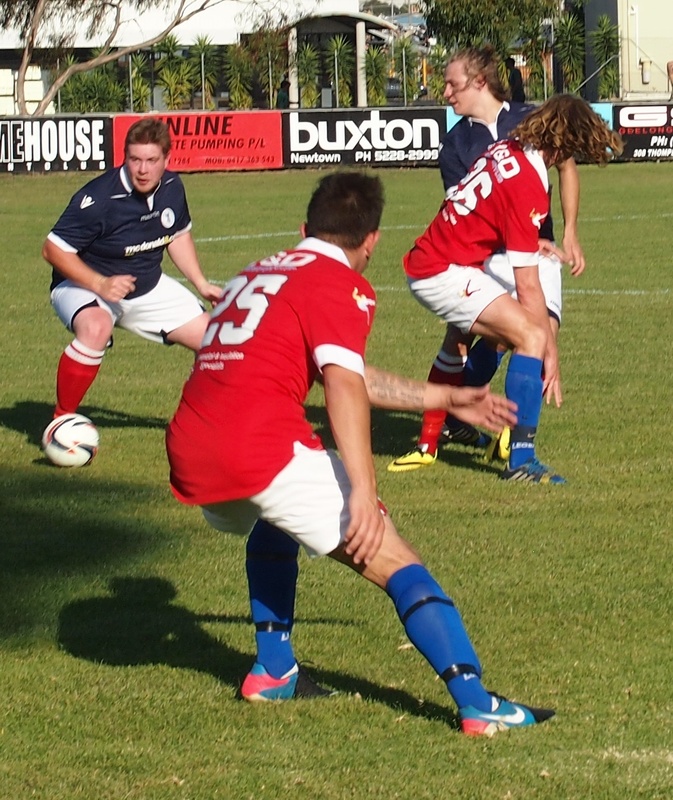 The first half was goal-less as the all whites defended stoutly and tried to hit on the break on several occasions. 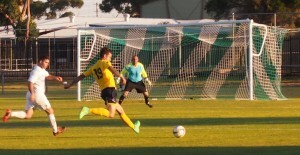 Eight minutes of the second half had passed when Corio made the breakthrough. 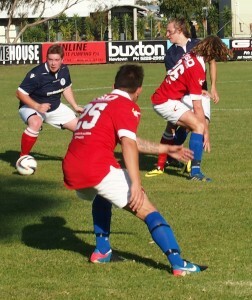 Paul McGlounan found himself in the clear directly in front of goal to score the opener. 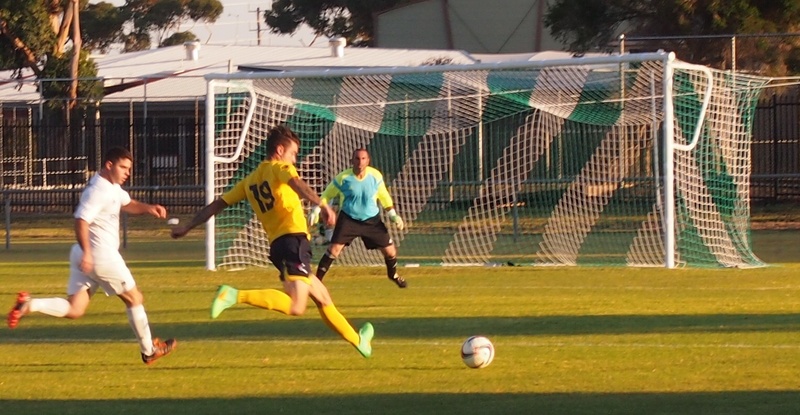 Two minutes later Steve Luczo doubled Corio’s advantage after a scramble in the goalmouth. In the 55th minute Bell Park got a goal back after some excellent pressure by Matthew Demo and Matthew Elson who had just come on as a substitute put the ball past Daniel Ellul. Angelo di Mauro in the Bell Park goal had an excellent game, saving several net-bound efforts including two in the 62nd minute. But even his heroics were not enough as Jayden Kinces put the third effort into the net. Tonight (Sunday) Geelong Rangers backs up against the unbeaten Lara at 6 pm, followed by tournament favourite Geelong against Corio in what should be one of the matches of this year’s event at 7.20 pm.